Today's colour combination was inspired by Emily from the blog Cupcakes and Cashmere. 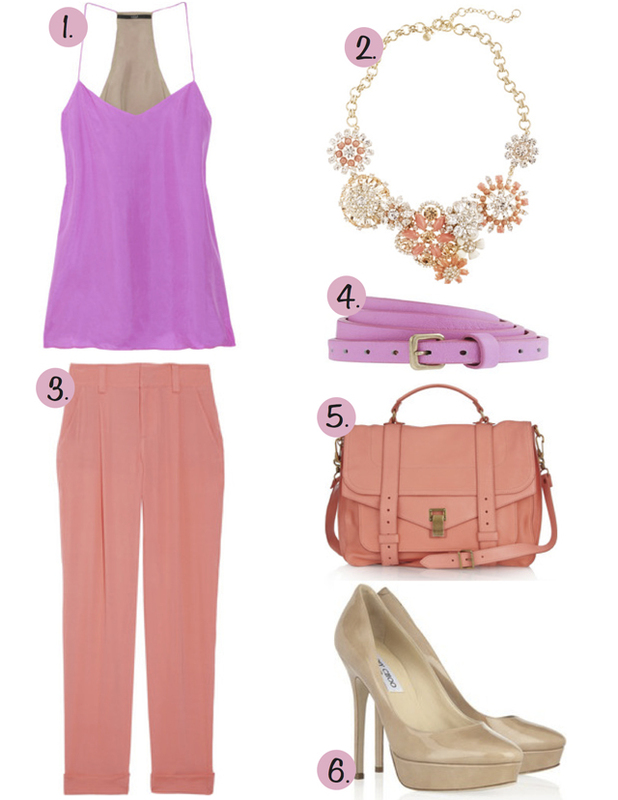 These colours together form such a fun feminine look. Whether you like it or not it captivates you. It made me question why I haven't tried it. I think we get scared when colours are similar to each other because we feel they might be too matchy matchy. However this example proves that sometimes it's quite a pleasant compliment! 1 Tibi Washed-silk racer-back tank, $175. 2 J.Crew Flower lattice necklace, $228. 3 Alice + Olivia Arthur cropped silk-blend crepe pants, $200. 4 J.Crew Skinny leather belt, $25. 5 Proenza Schouler PS1 large leather satchel, $1,995. 6. Jimmy Choo Cosmic patent-leather pumps, $695. i'm following u now with google!! do u want follow each other with bloglovin??? amazing outfit! u picked great colours and accessories! This is such a pretty look! Love those colours! Thanks for commenting on my blog doll. Love this gorgeous combo. This might just be the most gorgeous color combination ever. Beautiful! Never thought that all these colours together would make such a nice combination. I am impressed :) Love your blog!! wow! beautiful colors!!! I'm your newest follower! :) follow back? Beautiful combination!!! nice blog! take a look on my blog and if you like we can follow each other?